"It is a beautiful village and the Catweazle club can't tell you how thrilled we are to come to the village each year to celebrate with East Clandon at Home Farm's summer fete. We are very grateful to Neil, Bug and their family and friends at Home Farm for inviting us and allowing us the great pleasure of seeing the locations of a program that is very dear to many peoples hearts." 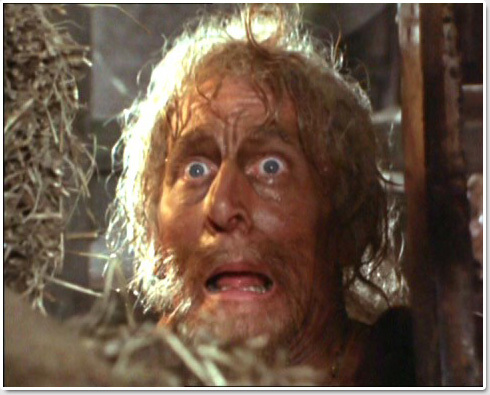 The current owners also host the village fete,and Catweazle fans are welcome to attend the fete and view the Barn at "Hexwood" but for privacy reasons, fans are asked not to seek to view it at other times. 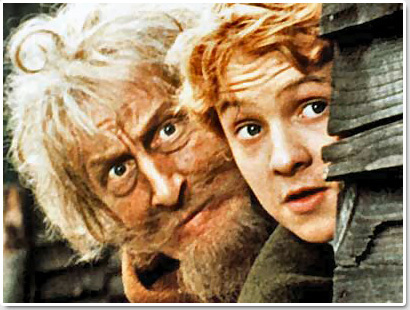 "After much scouting, a beautiful Surrey village called East Clandon was discovered and was perfect for the backdrop, surrounded as it was (and still is) by pastoral fields, leafy woods and classic English architecture....the water tower which became Catweazle's residence during the series was erected a few hundred metres down the road from the farm....Other filming locations such as the town and shops known in the series as "Westbourne" were shot over at the nearby village of East Horsley...otherwise the majority of the action was shot around the East Clandon base"
The top right picture is of Catweazle looking suitably perplexed at the new "magic" of the 20th century. 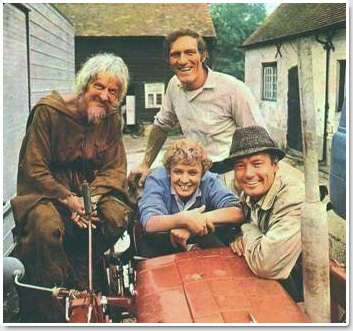 Above left is the cast sitting on a tractor, that was taken in the entrance to Home Farm (called Hexwood in the series). Right are Catweazle and Carrot in the barn at Home Farm.